That was some Doozy...hopefully we all made it relatively OK. This week's BOTW is.... a new one & we know you're gonna love it The Texan -Seasoned Grassfed Angus Patty with Provolone Cheese, Applewood smoked Bacon, Seasoned Fried Onions & Bourbon BBQ Sauce....I know, it's sound awesome, because it is! Have a great week & an awesome Labor Day Weekend!! Do you see that schedule? And we thought last week was busy! But it's all fun and good - we are rock'n and roll'n! Thursday we will be hanging with Bottlerocket Wine & Spirit. They even gave us a bottle of some delicious Red Wine to mix it up with our Burgers; we have a feeling you guys will love it. On Friday, we are hanging with The Art of Brooklyn, a festival of film, music & art. Saturday & Sunday, we will be at the Afro-Punk Festival at Commodore Barry Park. So come ready to enjoy some great music (free entry). Great music, Bike show, the Nike Battle For the Streets Skate and BMX Competition & some of the best Food Trucks (us:)...what more can you ask for. Thanks to everyone who came out and we are looking forward to seeing the rest of you! This week will be fun as we will be heading up to the Boogie Down at the NY Botanical Gardens. We will have the opportunity of feeding folks enjoying the fine music at the Waterlily Concert Series. Then on Saturday, we will be at the South Street Seaport partaking in PARKED! where we will be joined by other fellow Food Truckers and more great music, face painting & playground on site for kids....man I wish I was kid again :). So come hungry and ready to have a great time!! FiDi - you are in for a treat this week...we are bringing it back....Maker's Mark Kobe Burgers - Marinated Kobe Patty and marinated onion jam and oven roasted tomatoes! Yes - marinated with Maker's Mark of course. This week's BOTW is....The BYMARK - Seasoned Grassfed Angus Patty with Brie, sliced grilled mushrooms, Garlicky Lemon Aioli on a Brioche Bun. Maybe today's plans of hitting all five spots were a bit too ambitious! Finding parking and the traffic only gets worse as the day progresses & we almost ran out of Frites! It was great to see some old friends at 52nd & 6th ave and 26th & Park ave!! Lots of fun!! But no worries SoHo, FiDi & TriBeCa; we will get you. It will be a full menu + Thank You Free Frites where indicated. Thu Lunch (11am - 3pm) New Spot: LIC Lot at 43-29 Crescent Street; come hungry Citigroup!! 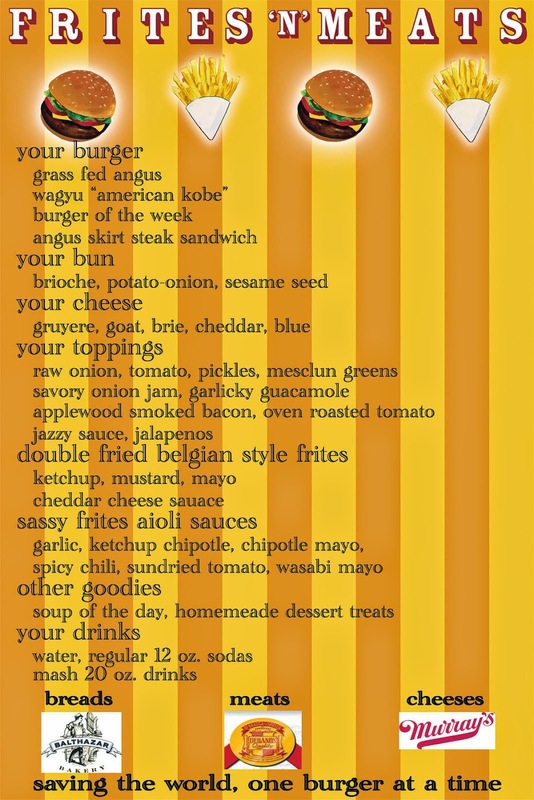 But what is the schedule without our Burger Of The Week! As always....Have a Great Week everyone! Ok Peeps....hope you are ready for us! We hope to see many of you Monday. The above hours and locations are approximations, so please make sure to follow our tweets for exact timing & locations. Thanks again NYC....that felt good...posting our schedule...no, it felt awesome!!! We love you guys!! As for the venue, we think it should be the place that we enjoyed most....the good old streets of NYC!!!! More particularly, the places we served everyone...Midtown, FiDi, SoHo, TriBeCa (exact locations to be tweeted). Although the forecast says 30% chance of rain on Monday, there will be a 100% chance of Free Frites...this is the least we can do for you guys. Our Monday Mission is to reach the above destinations (find parking) and give 100+ Free Frites at every location. BTW....some of you might see us this weekend in the city (can't tell you where ;)...but the Free Frites will be for Monday. Hope everyone is enjoying their summer so far. It's been a while since we have posted...we have been working diligently to get Frites'N'Meats back on the road before the summer is over so we can enjoy some of it with you....we miss you all very, very much! We miss seeing folks smile after we serve them, we miss asking you guys what next week's BOTW should be and the daily tweets; we can go on and on - WE MISS IT! We want to thank every single fan out there that donated to our rebuild efforts, emailed us, tweeted us, called us, some of you just wanted to hear us on the Frites'N'Meats hotline - your support has been overwhelming and kept our spirits up...it pumped us up with the determination to rebuild. YOU GUYS HAVE BEEN AMAZING!! The big Yellow and Orange Burger Love Palace can't wait to come out and dispense that Burger Love to NYC!! We would like to do something special for all of you but we are just looking for the proper venue to do so...will keep everyone posted. We are aiming to be in NYC Monday (8/8)...location pending and we will update everyone via the blog and twitter. Once again, Thank You Everyone and we can't wait to see you.